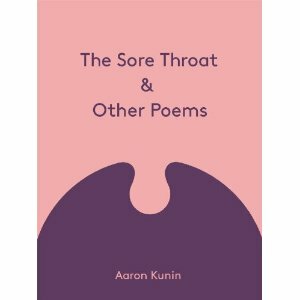 I'm not sure how old Aaron Kunin is, but even if I hadn't seen his author photo, I'd have guessed he was youngish...there's something about the words in this collection that feel youthful. I'm guessing he's a bit of a punk. Maybe the kid in the back row of the classroom, making smart remarks behind the teacher's back? In any case, The Sore Throat has been an intriguing read. He analyzes words in a way that twists them inside out, and the repetition of some words makes you look at them differently. The same word can be read differently, and I'm not just talking about synonyms. It's a feel of directness, and the collection almost feels like an accusation...there doesn't seem to be a divide between poet and reader. For example, in "No Word, No Sign", he toys with what is a word. the end of every idea is you. There's an ambiguity here that feels like this could be a romantic poem or one filled with hate. What "word" defines it as such? In "For Pleasure", a similar ambiguity or disconnectedness is felt...is he commiserating or insulting? "Sigh no more," moron, sigh no more! Be kind, be kind, and be knowing! 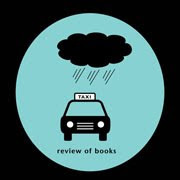 Rain Taxi magazine (Vol.15, No.3) had a review by Sumita Chakraborty that explained that Kunin uses only about 200 words in the entire collection, and that some of this is a nod to Ezra Pound. I'm not familiar enough with Pound to have caught on to that, but I did notice the limited use of words and the repetition. Maybe it's more an allusion to Mies van der Rohe, "Less is more." I don't think it ever translates as cramped; Kunin feels very comfortable within his own confines. And the lack of the expansive verbosity that appears in some poetry makes this collection almost pop in it's brevity and forthrightness. This is an intricate collection that is bold and unhesitant. Special thanks to Fence Books for the Review Copy.